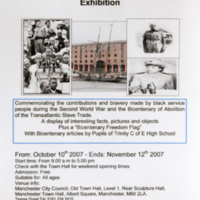 An exhibition by Manchester City Council held at Manchester Town Hall commemorated the contributions of Black service people during World War II. The exhibition also included the Bicentenary Freedom Flag, to mark commemorations of the Abolition Act of 1807. Alongside exploring the efforts of women, West Indian men, and African men in wartime, the exhibition also told the story of the 761st Tank Battalion of the US Army, known as the Black Panthers Tanker Battalion. Primarily made up of African-American soldiers, the squadron was said to be deployed as a public relations effort to maintain support for the war effort from the Black community. In 2000, a graffiti collective called Rocking The Nation (RTN) began The Crenshaw Wall, colloquially known as The Great Wall of Crenshaw. At 7,787 feet long, the mural has become a landmark for the area. 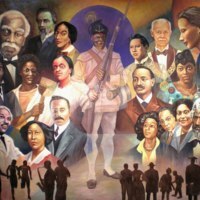 The timeline depicts African American history, and features the antislavery figures Frederick Douglass and Harriet Tubman, as well as Marcus Garvey, black soldiers from World War I, II and Vietnam, and Ethiopia’s Emperor Haile Selassie. A shackled slave breaks free from his chains and evolves into an athlete, American footballer and basketball player. Further along the mural are Black Panther Party leaders alongside Martin Luther King Jr., and Malcolm X. The mural starts with a black woman breathing life into the mural and ends with a couple giving birth.“We finally get the chance to paint the Crenshaw Wall, and bring some black awareness to the Crenshaw Wall – to teach the history of our people, to teach our people to be proud, to teach our people love, and where we came from and where we might possibly end up,” explained Enk One of RTN.Over a decade later, the mural requires restoration and protection. 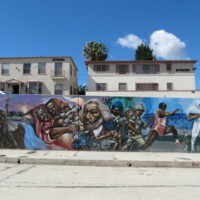 RTN are working towards this goal, as well as designating the mural a historical landmark, renaming the block ‘Crenshaw Mural Square’ and developing an app that gives a visual tour of the mural. 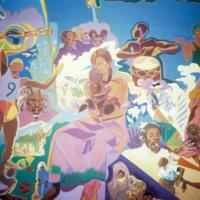 This mural was created in 2012 by Munir D. Mohammad for the Rhode Island Black Heritage Society, one of the oldest African heritage organisations in the country. Titled The Shoulders of Heroes We Lean On, the mural depicts giants of black history, including the antislavery leader Frederick Douglass, as well as the silhouettes of athletes, musicians and scholars.